I grew up in Southern California and I remember my dad having a passion for two things. Motorcycles and Cars. Growing up, our garage was filled with classic BMW’s, Chevy’s, GMC’s, Husqvarna’s, Yamaha’s, and even a Unimog that he worked on and tinkered with constantly. 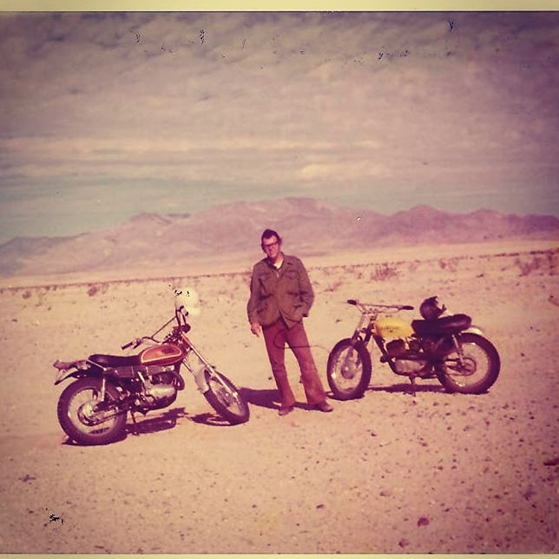 His passion, knowledge, and aptitude for mechanics, design, and engineering contributed and fueled my overall curiosity and interest in both cars and motorcycles, however, I didn’t start riding until later in life. Nick and I started practicing at local parking lots where I became familiar with understanding how to control my motorcycle (a 2002 Honda Magna). 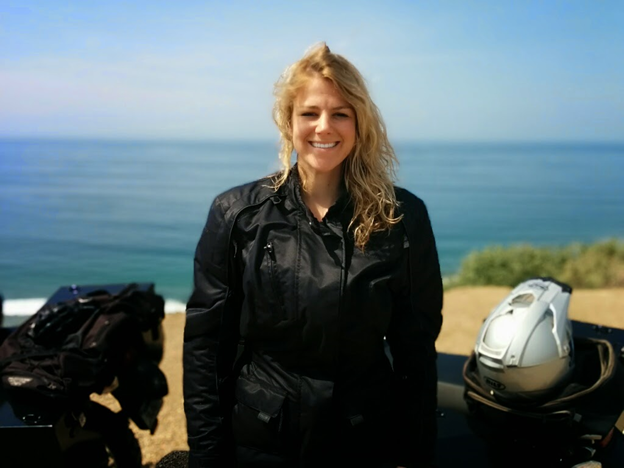 Shortly thereafter, I enrolled in a motorcycle safety course at the local community college where I received my M1 (I would highly recommend this for newbies or any other rider looking to refresh their skills and knowledge of motorcycle safety). I purchased my first bike (a 2008 KLR650…just like Nick’s) and quickly became excited about going on adventures with him. Just the two of us on the open road experiencing life in a different way, a more real way. My First time learning how to ride on a 2002 Honda Magna. Nick and I posing for a picture each on our own bike. We started riding everywhere. All of the time. And since we were on adventure bikes, we could go anywhere! This was the attraction for me, that this motorcycle could literally take me anywhere. 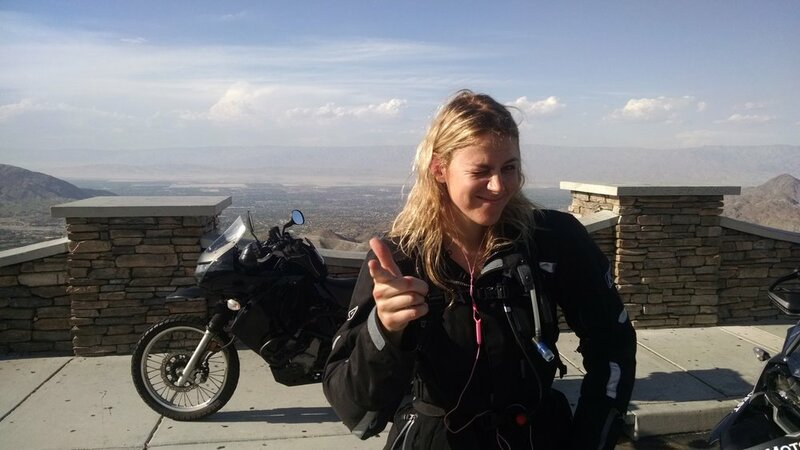 To date, Nick and I have ridden through California, Nevada, Arizona, and Utah on our bikes. We even spent part of our honeymoon in Europe riding through Austria and the Czech Republic each on our own adventure bike, a BMW R1200gs. 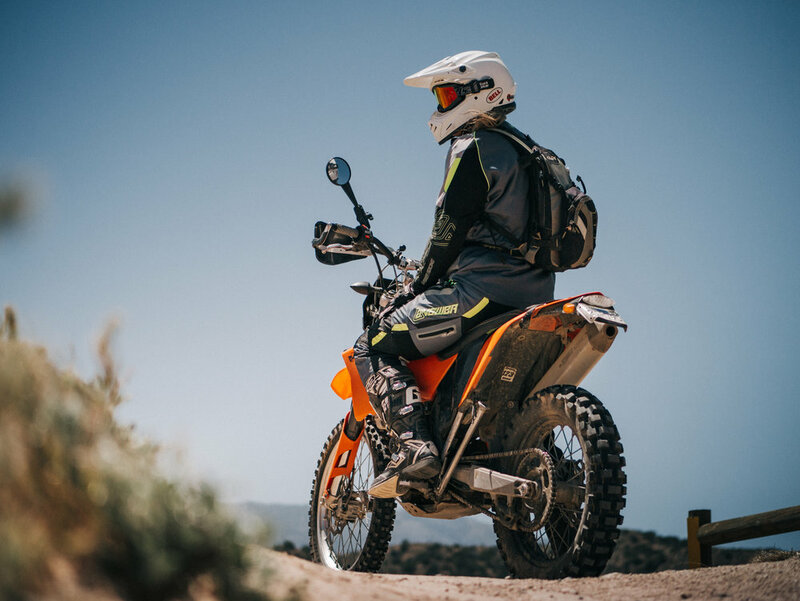 Having an adventure bike was also my introduction to riding on the dirt; however, I quickly realized that having a big, heavy bike wasn’t the best for a beginner. So, I purchased my first “dual-sport” motorcycle a 2004 KLR250 and started riding local trails. 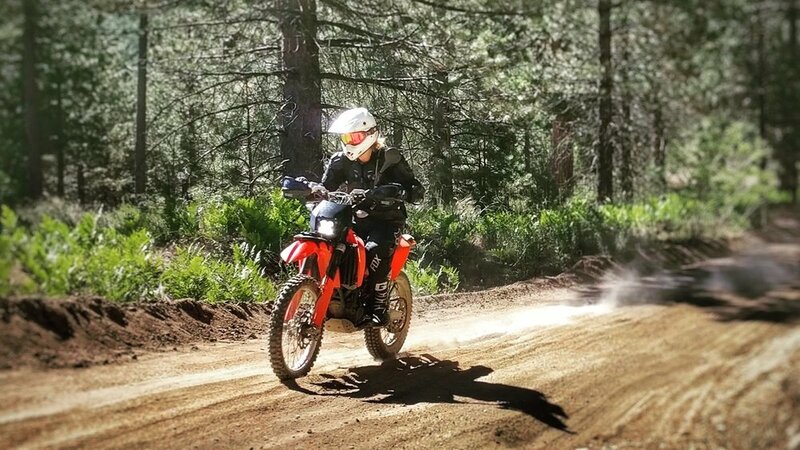 I was amazed at how different and exciting riding my 250 became (since then, I’ve acquired a 2008 KTM 450exc). There are some local dirt schools that help with understanding means and methods for riding, so I took classes to help with my confidence as well as enlisted help from friends and family who grew up riding dirt bikes. The more you get out there, the better you become and I learned that quickly. The adventure for me is continuously working on myself to grow, become a better rider, and share those successes and adventures with the people around me. Riding motorcycles is exhilarating. 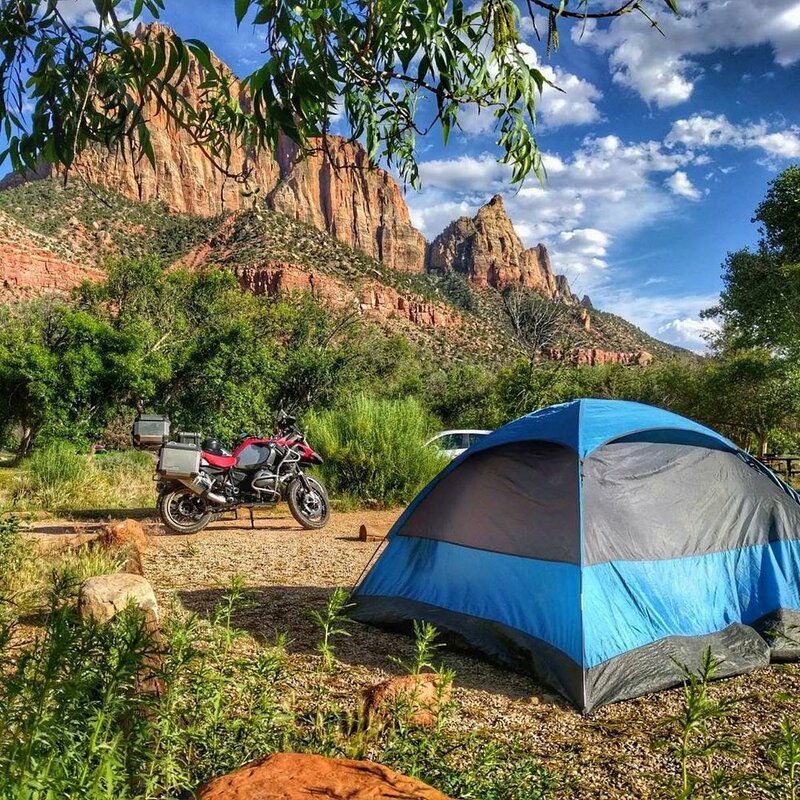 I love to load up the bikes with camping gear and travel miles experiencing all of the elements that you don’t typically feel if you are in your car. The wind, the rain, the heat, and the cold are all amplified 100 times over. 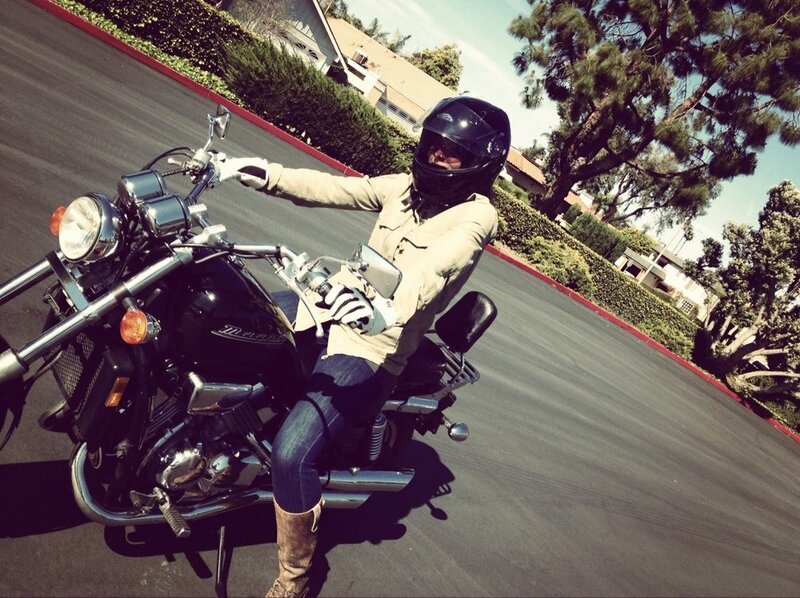 Going on a motorcycle trip takes me through a plethora of emotions and pushes my limits. The anticipation, excitement, fear, curiosity, independence, love/hate relationship that I experience every time I’m on a motorcycle is unparalleled but always keeps me wanting more. Nick and I didn’t grow up riding though, so we were unfamiliar with what was out there. Where would our next adventure take us? We explored the internet and were amazed at how big the riding community was, specifically in the world of dual-sport/adv. Sites like advrider.com, klr650.net, furkot.com, butlermaps.com, ktmtalk, Thumpertalk, and Ride Dual Sport helped us plan out trips as well as aided us with improving and maintaining our motorcycle. 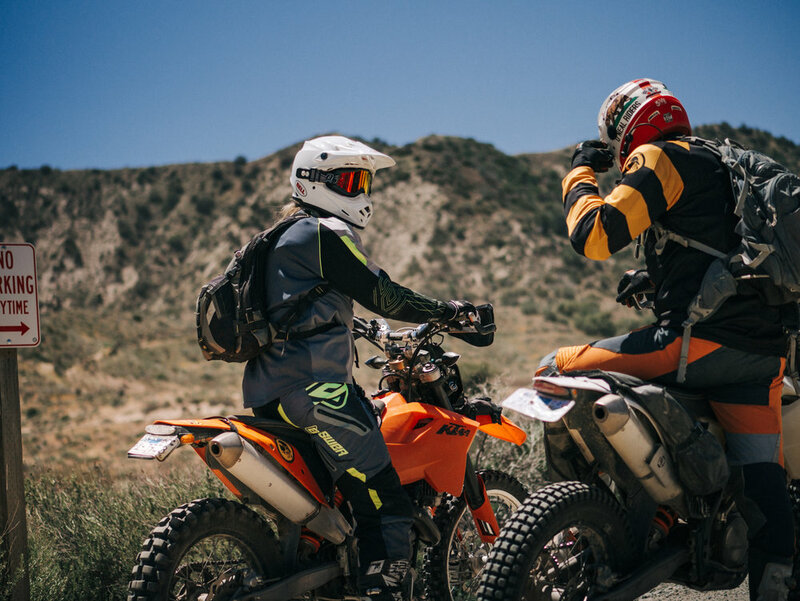 We also stumbled across a couple of great riding websites and shortly found a local dual-sport club, The Orange County Dualies, right in our own backyard. Since then, I’ve become an active member of the Orange County Dualies. The Dualies are a dual sport motorcycle club based out of Orange County, CA. They were formed in 1994 by a group of motorcycle enthusiasts well versed in dual-sport and adventure riding before it ever became popular. Today, we are a recognized 501(c)(3) nonprofit organization and our mission is to raise funds for the Pediatric Brain Tumor Foundation (PBTF) while also promoting dual sport motorcycle riding. From 2015-2017, I acted as the Vice President of the organization and hosted monthly meetings, group rides, as well as AMA sanctioned Dual Sport events benefiting the PBTF. To date, we’ve raised over $438,000 for the charity. This year, the Dualies will host one main ride out of Banning, CA. 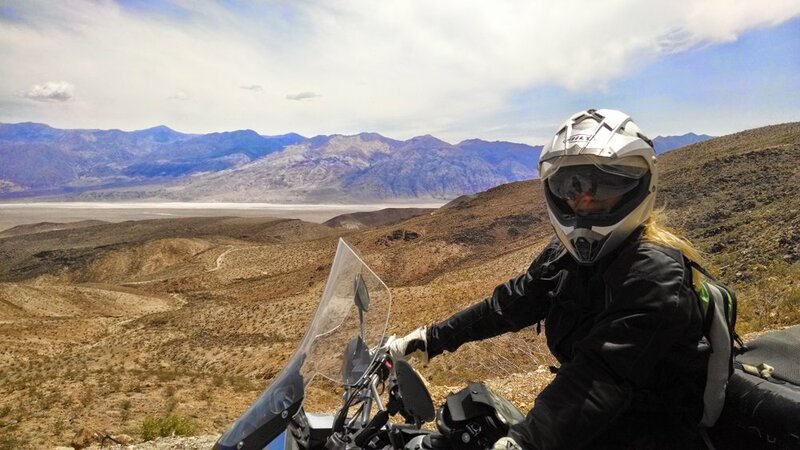 The Dualies "Palms to Pines Charity Ride" will take place in November 3, 2018 and will explore areas of the San Jacinto forest, Hemet, and Idyllwild. The ride consists of easy-to-challenging route options for all skill levels. I encourage all riders to come out, participate, and have fun while contributing to a great cause! More information can be found at our website: Orange County Dualies. Since being an active officer of the Dualies, I’ve become more involved and seen other organizations do great things in order to keep our trails available for public use as well as get people excited about dual-sport riding. Clubs that are a part of AMA District 37 (i.e. Big Bear Trail Riders, Ventura County Motorcycle Club, Cal Poly Penguins, Prospectors M/C etc.) 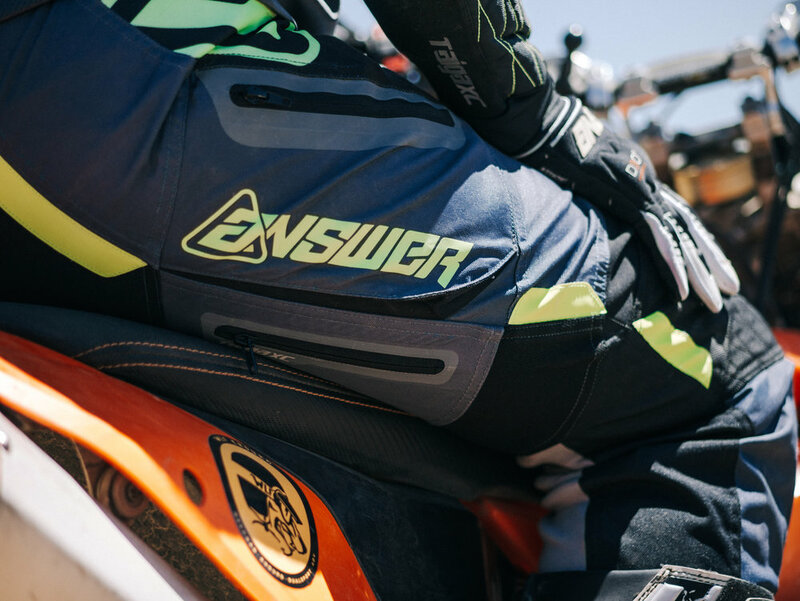 and organizations such as CORVA (California Off-Road Vehicle Association), Crawdad Offroad Events (C.O.R.E), Rescue 3, Stewards of the Sequoias, PBTF Ride for Kids, Babes Ride Out, and of course WLFEnduro are what make the motorcycle community grow and become what it is today. GEAR: There is a term for it…”A.T.G.A.T.T.”. 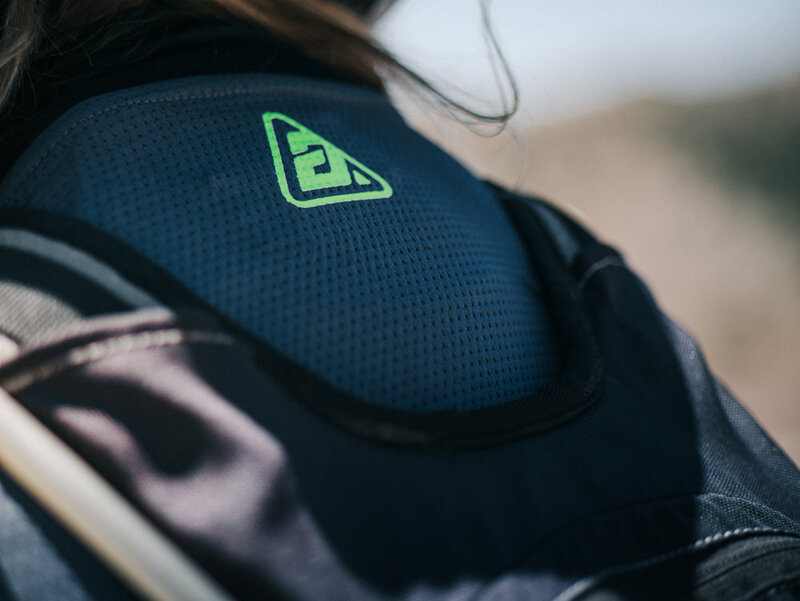 “All The Gear All The Time.” Since I ride both on and off road, I look for products that suite these need. 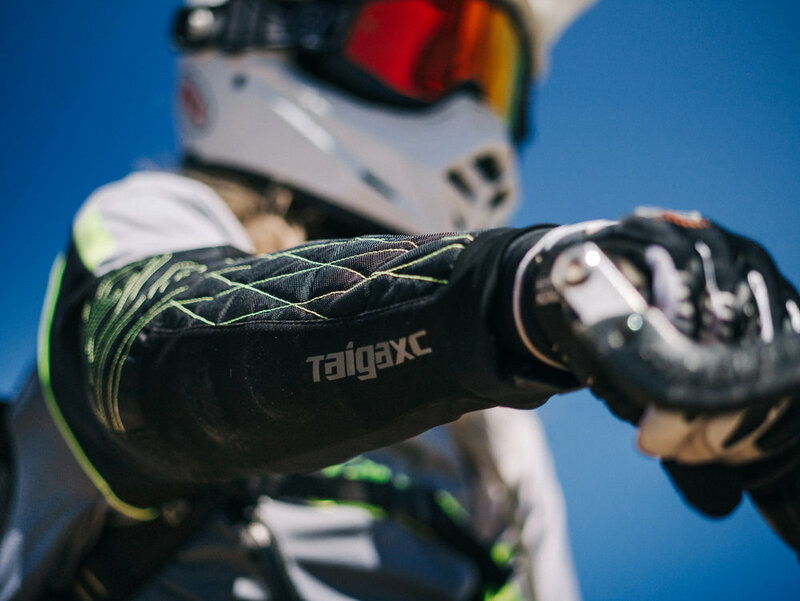 Specifically, I’ve been a fan of the following for my off road gear: ANSWER Taiga XC Line (jersey and pant): The gear provides excellent ventilation, pockets for storage, strategically placed abrasion materials/padding while also giving me the ability to flex and move appropriately. 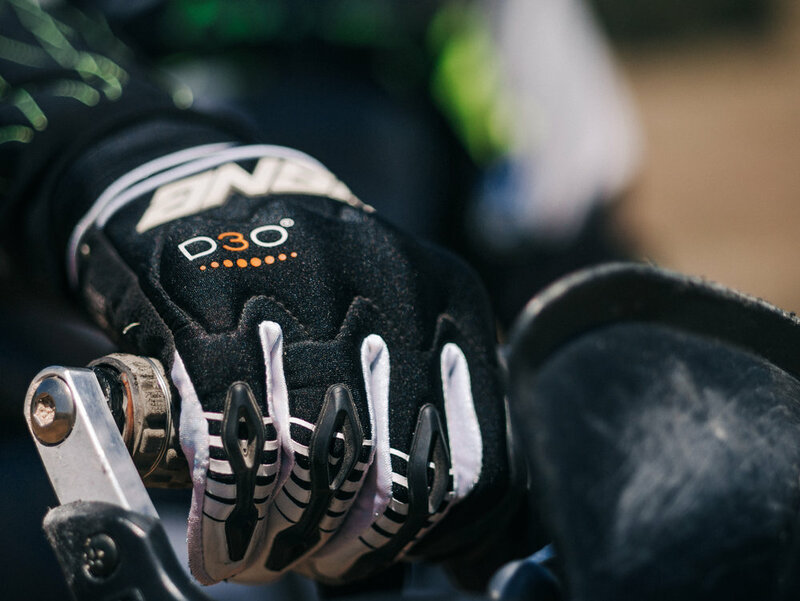 ANSWER AR-5 Gloves: these gloves provide a new type of armor, D30, which keep me protected but still absorbs impacts appropriately. 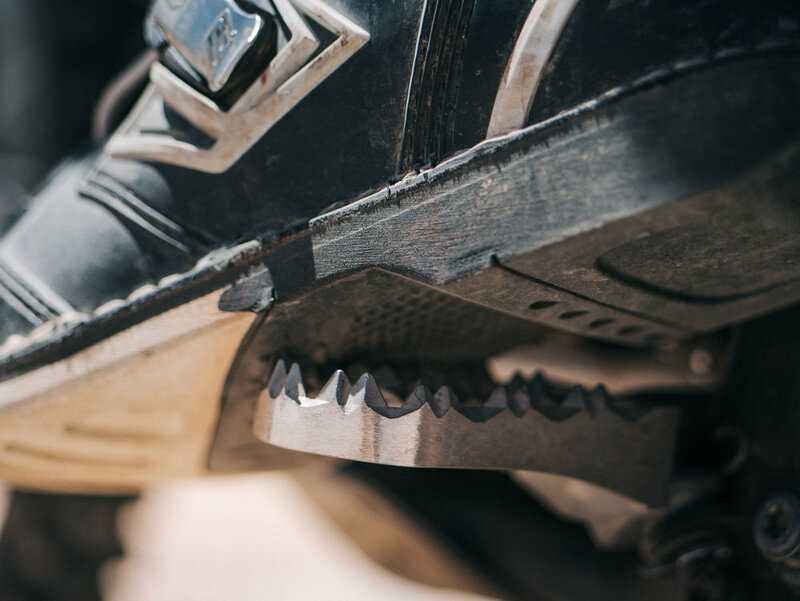 FOOT PEGS: Foot pegs are an integral part of moving your motorcycle. With that in mind, I am always drawn to IMS for their excellence in craftsmanship and variety of pegs they offer. Currently, I have upgraded to the IMS Core Enduro Pegs and they are amazing! Since upgrading from my stock pegs I have increased control, excellent grip, and a wider platform for use...not to mention, installation was easy! Recently, my husband and I purchased a used 2003 Yamaha WR450 and took my father out on his first dirt ride in over 30 years. It was so exciting for me and he RIPPED! Riding with him was one of my most memorable moments on a motorcycle to date. To see the spark ignite in my father again for a passion that he had put aside for 30 years in order to raise 4 children was a very emotional experience. We were all stoked and Nick and I plan on taking him on some more adventures in the near future. I also sold my KLR650 and am in the market for a new bike; however, can’t decide on which bike I want. In the meantime, I do have a plated KTM 450 and can always hop on my husband’s BMW R1200GSA that’s readily available (thanks Nick!). My dad on his first ride in 30 years. I’ve had to step down as Vice President of the OC Dualies for 2018 because I received a promotion at work and am focusing my efforts on where I wanted to go directionally for my career. It was a hard decision to make, but with the support of friends, family, as well as the organization I know it was the right decision. I am still a Dualie member and will be volunteering my time as well as participating in events in the near future, such as the Ride for Kids in April and the November OCDualies Palm to Pines Ride. For 2018 I plan to go riding with Nick, take camping trips around California with our two dogs, and work on our home that we purchased recently. I also work in the Electrical Utility Industry as a Construction Project Manager and am one of the few women in a male-dominated environment. I am excited about my new job promotion, the challenges that lie ahead, and can’t wait to see what the future holds. On top of that, I also plan on going back to school for my M.B.A. this fall. There is a lot going on in my life at the moment, but I’m reminded to always remember to stop and enjoy the things that make you the happiest. Riding my motorcycle is one of those things. 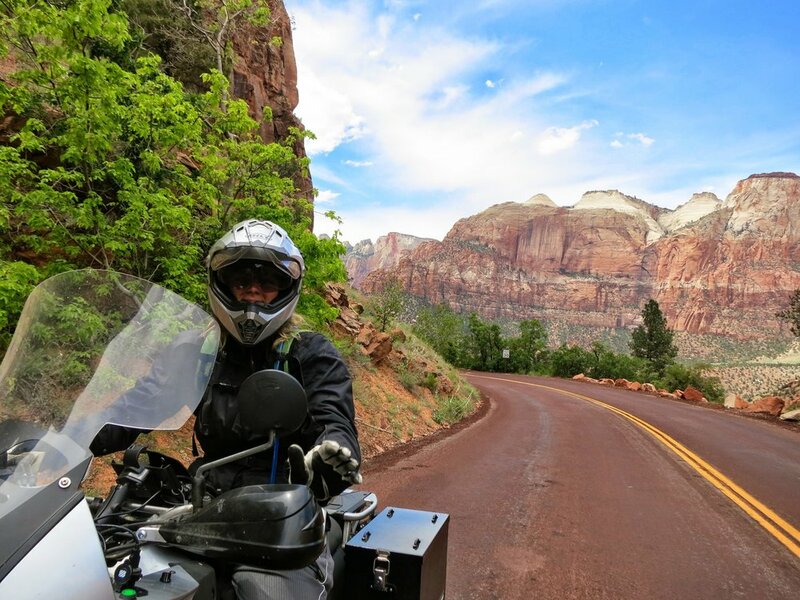 I feel fortunate to have been able to ride through some of the most scenic parts of the world and to have met some of the most incredible people just by being on a motorcycle. This is the adventure, this is the journey, and it’s all about making memories. Last year, the OCDualies held a club ride that was “Newbie Friendly” beginning at the Mill Creek Visitors Center in Mentone, CA leading up to Big Bear. 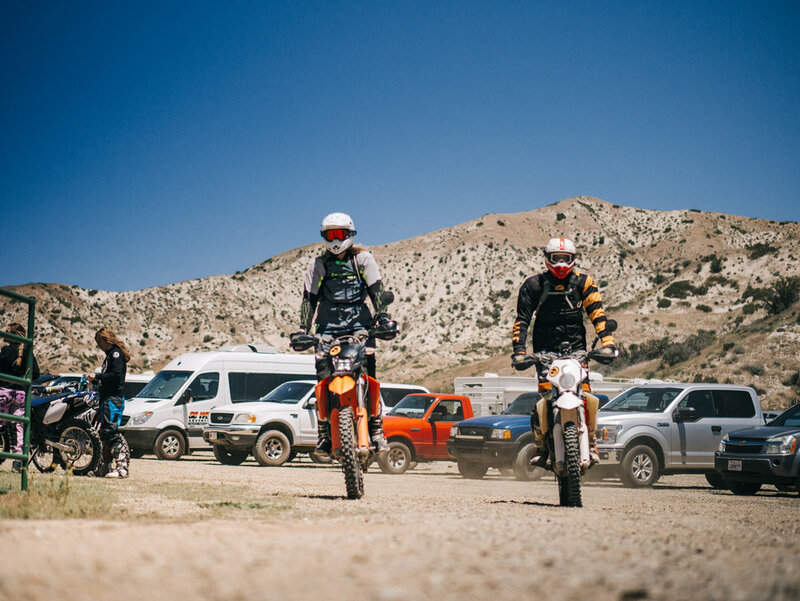 The Newbie Ride was one of my favorite club events we hosted where both beginners and more experienced riders could offer tips and advice on how to approach the different terrain and become a better rider. Bikes: I highly recommend you use a dual sport or adventure motorcycle (street legal). Sandra has been an inspiration to the entire WLF crew. 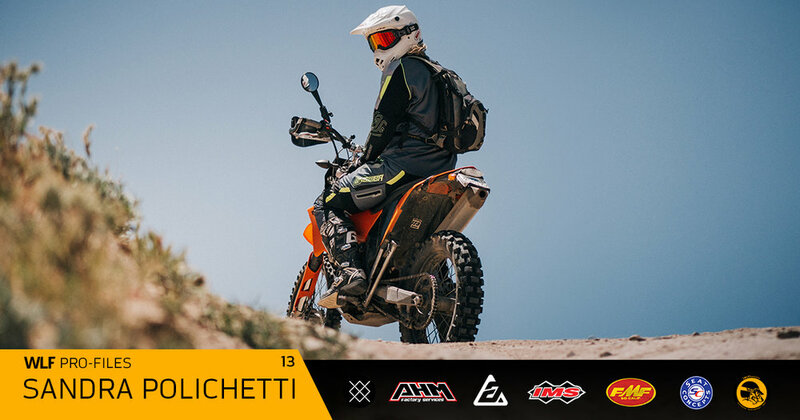 From street to dirt, ADV bikes to dirt bikes she's tackled them all! Sandra has been an amazing resource of knowledge and experience that the WLF crew has been stoked to benefit from. Nick and Sandra are leading the charge in the off road community! If you have any questions or just want to give Sandra a high five, you can leave a comment below!